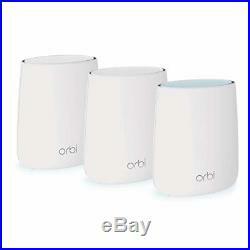 NETGEAR Orbi Whole Home Mesh WiFi System – WiFi router and 2 satellite extenders. NETGEAR Orbi Whole Home Mesh WiFi System – WiFi router and 2 satellite extenders with speeds up to 2.2 Gbps over 6,000 sq. Whole Home WiFi Coverage. Whole Home Coverage – Upstairs and Downstairs. Eliminate deadzones throughout your whole home up to 6,000 square feet! 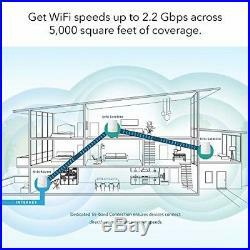 Other WiFi systems lose speed and range over large distances. Fast and reliable WiFi coverage. 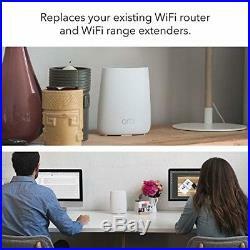 Connect all your WiFi devices without losing speeds! 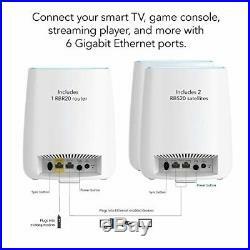 Freely roam around your home with uninterrupted streaming and downloading. Limit daily internet time for websites, apps, and more. Set individual filter levels for family members to match their age and interests. Each Orbi device comes with 4 Gigabit Ethernet ports. This is ideal to hard-wire entertainment centers, game systems, and home offices for fast Internet speeds. Expandable for more WiFi coverage. Easily add more Orbi satellites to your existing Orbi WiFi system for additional WiFi coverage. Easily create a Guest Network. Be a good host and have your guests experience the best WiFi in town. Easily and securely share your home or Guest WiFi credentials. Orbi RBK23 by NETGEAR is a Whole Home WiFi System that delivers AC2200 WiFi up to 6,000 square feet. FastLane3 provides better 4K HD gaming & streaming, no matter how many devices connect. 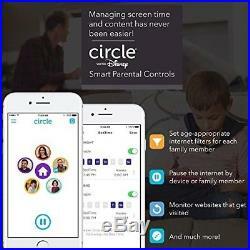 Circle with Disney Smart Parental Controls let you easily manage content & time online on any device. Creates a Mesh WiFi network that blankets your home in super fast, seamless WiFi room to room, wall to wall, floor to floor. Replaces your old router, works with your modem and internet service provider. Unlike tiny routers and extenders, Orbis vertical design provides superior speed, WiFi range and minimal interference. Eliminates WiFi dead zones and buffering 6,000 square feet of consistent coverage at speeds up to 2.2 Gbps (gigabytes per second). Maintains speed even as more devices use your WiFi at the same time the difference is tri-band technology, others use dual band. Simple setup with the Orbi app create guest network, access parental controls, and run speed tests right from the app. 2 Ethernet ports on both router and satellites provide a wired connection to your Smart TV and more. Smart parental controls let you filter content, manage screen time, and monitor usage on any connected device, anytime, anywhere. We stand behind our products. Our stock all ships from our US-based warehouses. Most orders are in transit for two days but some may take longer. 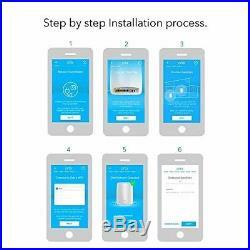 NETGEAR Orbi Whole Home Mesh WiFi System – WiFi router and 2 satellite extenders Make sure this fits by entering your model number. Replaces your old router, works with your modem and internet service providerUnlike tiny routers and extenders, Orbis vertical design provides superior speed, WiFi range and minimal interferenceEliminates WiFi dead zones and buffering 6,000 square feet of consistent coverage at speeds up to 2.2 Gbps (gigabytes per second)Maintains speed even as more devices use your WiFi at the same time the difference is tri-band technology, others use dual bandSimple setup with the Orbi app create guest network, access parental cont. The item “NETGEAR Orbi Whole Home Mesh WiFi System WiFi router and 2 satellite extenders” is in sale since Monday, November 26, 2018. This item is in the category “Computers/Tablets & Networking\Home Networking & Connectivity\Wireless Routers”. The seller is “partisanmma” and is located in Phoenix, AZ. This item can be shipped to United States, Canada, United Kingdom, Denmark, Romania, Slovakia, Bulgaria, Czech republic, Finland, Hungary, Latvia, Lithuania, Malta, Estonia, Australia, Greece, Portugal, Cyprus, Slovenia, Japan, China, Sweden, South Korea, Indonesia, Taiwan, South africa, Thailand, Belgium, France, Hong Kong, Ireland, Netherlands, Poland, Spain, Italy, Germany, Austria, Bahamas, Israel, Mexico, New Zealand, Philippines, Singapore, Switzerland, Norway, Croatia, Brazil, Chile, Colombia, Viet nam.